I believe that an individual is more than just a snapshot of one particular accomplishment in their lifetime. 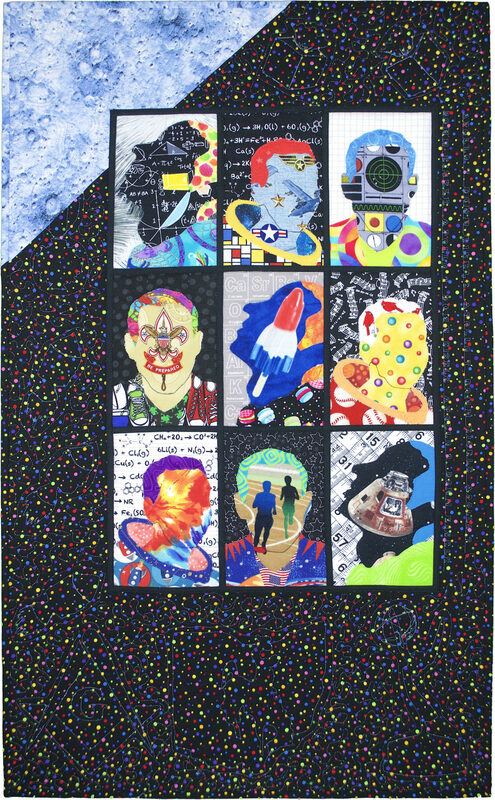 Using techniques I learned in Lisa Ellis’ “Wacky Family Portrait’ class, I portrayed Astronaut Donn Eisele in three poses (derived from NASA photographs), letting the fabric tell a story about his life in a 1960’s Pop Art style. I continued to tell his story in the quilted motifs. Raw edge fusible applique, machine piecing, machine quilting. Commercially available cotton fabrics, Aurefil and Sulky threads,Fairfield Quilters 80/20 batting, Dritz bias tape.